Japanese optical glass maker Hoya Corp will build a huge plant in Laos to manufacture glass substrates for hard disk drives in response to growing demand from ballooning global data traffic. Each and every morning, the loudspeakers in Vientiane’s Sangveuy Village, of Sisattanak District, can be heard sending out a special message from the Village Chief, Mr Oudomxay Sisomphone. His message is clear and concise: stop burning garbage, and stop littering. THE Vientiane Motor Show 2019 at Lao-ITECC from February 22 to March 2 will feature a wide variety of models from leading automakers ready to tempt car buyers. Bringing fresh hope and a hot coffee like a brand new day, Vanmai Coffee is a community of families in Northern Laos, growing coffee in a bid to leave behind troubles of opium, conflict, and poverty. Sikhottabong Stupa festival is held annually during the full moon in February (Feb 19, 2019) and it is celebrated over several days. 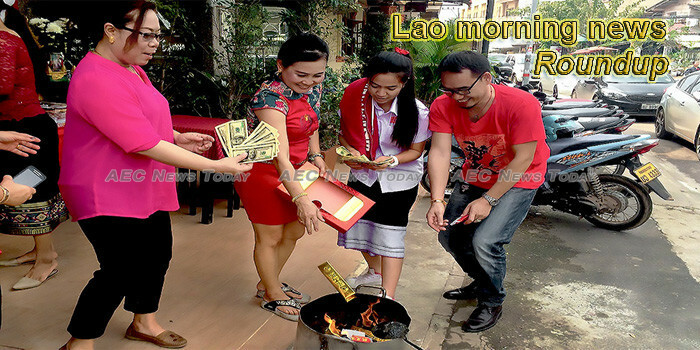 This week’s Lao morning news feature photo acknowledges Chinese New Year, 2019.